Rugged and timeless, our rustic drawer and cabinet pulls are suitable for new construction or period home renovations. Choose from a wide selection of styles, sizes and finishes for a quick and tasteful home update. 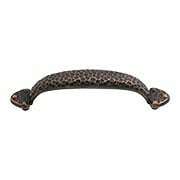 Our Olde-World Cabinet Pull (5-Inch Center-to-Center) provides an eclectic accent to almost any interior space. 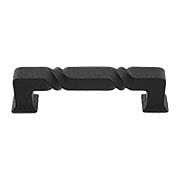 This sturdy pull features a textured surface that pairs beautifully with natural design elements in the kitchen or bath. Choose from an array of unique options. The Distressed Cabinet Pull (3-Inch Center-to-Center) offers rustic, natural style in classic shapes. Originally designed for Mediterranean kitchens, this pull pairs beautifully with river rock or other natural design elements in the kitchen or bath. Choose from an array of unique finish options. 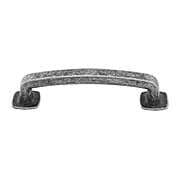 The Distressed Cabinet Pull (5 1/16-Inch Center-to-Center) offers rustic, natural style in classic shapes. Originally designed for Mediterranean kitchens, this pull pairs beautifully with river rock or other natural design elements in the kitchen or bath. Choose from an array of unique finish options. The Belcastel 3 3/4" Center-to-Center Flat-Bottom Pull offers Colonial style with a hint of old-world charm. Lending a nostalgic look to both cabinets and drawers alike, it features straight lines and a minimal design. It pairs beautifully with river rock or other natural design elements in your kitchen or bath. Choose from an array of unique finishes. Inspired by the American Arts and Crafts movement, the Ruskin collection echoes the straight lines and simple design of the era. This pull features a rustic, handcrafted look complete with pyramid head accents. 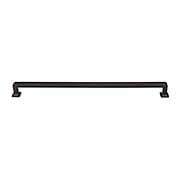 Fully concealed mounting offers clean sophistication that can be installed in minutes! Our Olde-World Cabinet Pull (3-Inch Center-to-Center) provides an eclectic accent to almost any interior space. 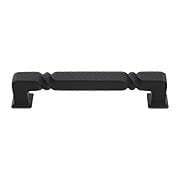 This sturdy pull features a textured surface that pairs beautifully with natural design elements in the kitchen or bath. Choose from an array of unique options. 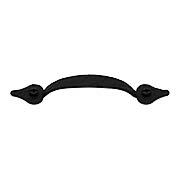 The Normandy Twist D Pull (3 3/4-Inch Center-to-Center) gives your drawers and cabinets a touch of French-country style. Designed with the look of hand-forged iron and a classic twist, it comes in an array of popular finish options. Wherever you use it, this durable handle will withstand the test of time. 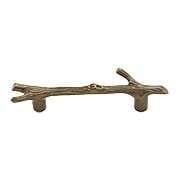 Bring the beauty of nature into your home with this delightful Twig Pull. Display for contrast on a sleek cupboard or as a matching accent on more rugged, cabin style furniture. Available in an array of unique finishes. The Distressed Cabinet Pull (6 5/16-Inch Center-to-Center) offers rustic, natural style in classic shapes. Originally designed for Mediterranean kitchens, this pull pairs beautifully with river rock or other natural design elements in the kitchen or bath. Choose from an array of unique finish options. The Tahoe 5" Center-to-Center Cabinet Pull offers subtle rustic style in classic shapes. Both versatile and durable it features a geometric silhouette with double twists. Choose from an array of slightly distressed finishes. 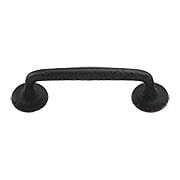 The Tahoe 3 3/4" Center-to-Center Cabinet Pull offers subtle rustic style in classic shapes. Both versatile and durable it features a geometric silhouette with double twists. Choose from an array of slightly distressed finishes. This rough textured, Mission-style bail pull offers instant, old-world style to your larger drawers. 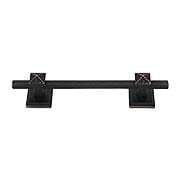 The heavy-duty thickness of the finely cast solid iron, ensures long-lasting wear. Although it’s finished in a black primer coat, painting is recommended before installation. 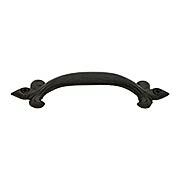 The Norman Crest Pull (4-Inch Center-to-Center) gives your drawers and cabinets a touch of French-country style. 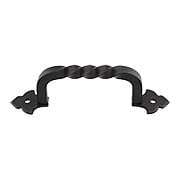 Designed with the look of hand-forged iron and a classic twist, it comes in an array of popular finish options. 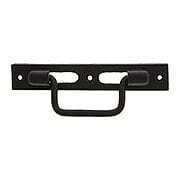 Wherever you use it, this durable handle withstands the test of time. The Normandy Twist D Pull (6-Inch Center-to-Center) gives your drawers and cabinets a touch of French-country style. 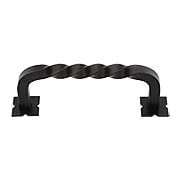 Designed with the look of hand-forged iron and a classic twist, it comes in an array of popular finish options. 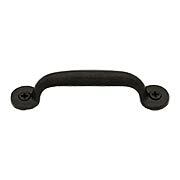 Wherever you use it, this durable handle will withstand the test of time. 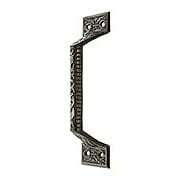 The Ascendra Cabinet Pull (12" CTC) is a nod to the American Arts and Crafts movement. Fresh yet somewhat stately, it features straight lines and simple design of the era. Choose from an array of popular finish options. The Normandy Pull gives your drawers and cabinets a touch of French-country style. 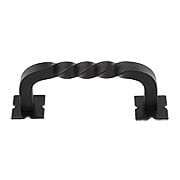 Designed with the look of hand forged iron and a classic twist, it comes in an array of popular finishes. Wherever you use it, this durable handle will withstand the test of time. Our Olde-World Cabinet Pull (7 9/16-Inch Center-to-Center) provides an eclectic accent to almost any interior space. This sturdy pull features a textured surface that pairs beautifully with natural design elements in the kitchen or bath. Choose from an array of unique options.